Hardwood floor resurfacing is our core service at Fabulous Floors Akron. The majority of hardwood floors have regular wear and scratches from everyday use. Wood floors get a lot of unexpected wear, just from your normal daily routine! Traditionally the only restorative solution used to be sanding down to bare wood and refinishing completely. That’s still an option, but is not always the best or most affordable option, and that is where resurfacing comes into play. We restore the original shine of your wood floors without the dust, mess or odor typically associated with hardwood refinishing. The ideal floor that is eligible for resurfacing rather than complete refinishing is a floor that has some visible wear with light scratches. There aren’t any signs of bare wood, and the finish is all pretty much still visible. Separations or warping between the boards are minimal and the majority of the floor is in good shape overall. Floors with this type of regular wear don’t require the intensity of labor, time and expense of a complete hardwood refinishing service. These floors only need a face-lift and some professional tender loving care. Fabulous Floors technicians can gently sand and buff away the surface marks, nicks, scuffs and general wear. We will then apply a coat of high quality, long-lasting polyurethane. This service is noninvasive to the flooring and to your family. Hardwood resurfacing does not affect the color or integrity of the wood; it does not create airborne dust or fumes and it is completely Green – safe for your family, our staff and the environment. You don’t have to leave your home, and you don’t have to worry about cleaning up a mess when we leave. It is the single most cost effective value-added home improvement available. We provide our resurfacing service at a fraction of the cost of traditional refinishing! 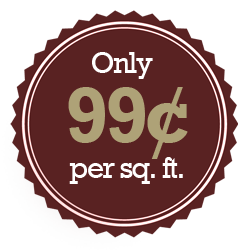 It’s only 99¢ per square foot and can be completed within hours – typically just one day. Time saving. Most Fabulous Floors® resurfacing treatments can be done in a few hours. Durable finish. Final finish is long-lasting polyurethane. Choice of gloss, semi-gloss or satin. Nicks and scratches in your floors finish are gently sanded without removing precious wood. We save you time and money by doing the work for you. Don’t worry about lugging expensive equipment all over your home! There is absolutely nothing to cleanup after we’re gone. Give us a call today to get started with our unique resurfacing service!